A Foray Into the Worlds of Animals and Humans: A Picture Book of Invisible Worlds, 1934–, Log. 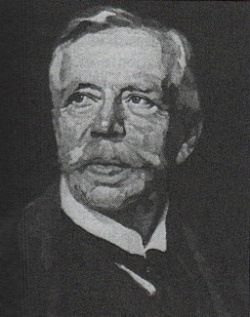 Jakob Johann Baron von Uexküll (1864–1944) was a Baltic German biologist who worked in the fields of muscular physiology, animal behaviour studies, and the cybernetics of life. Theoretical Biology, trans. D. L. MacKinnon, London: Kegan Paul, Trench, Trubner & Co, 1926, xvi+362 pp. "A Stroll Through the Worlds of Animals and Men: A Picture Book of Invisible Worlds", in Instinctive Behavior: The Development of a Modern Concept, ed. & trans. Claire H. Schiller, New York: International Universities Press, 1957, pp 5-80; repr. in Semiotica 89:4 (1992), pp 319-391. A Foray into the Worlds of Animals and Humans, with A Theory of Meaning, trans. Joseph D. O’Neil, University of Minnesota Press, 2010, 272 pp. "The Theory of Meaning", Semiotica 42:1, The Hague: Mouton, 1982, pp 25-82. 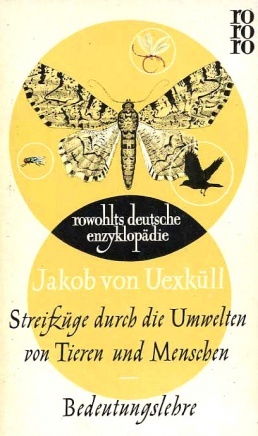 Jakob von Uexküll: The Discovery of the Umwelt between Biosemiotics and Theoretical Biology, Springer, 2015, PDF. Sign Systems Studies, Vol. 32:1/2, Special Issue: "Uexküll", 2004. Helene Weiss, "Aristotle's Teleology and Uexküll's Theory of Living Nature", The Classical Quarterly 42:1/2 (Jan-Apr 1948), pp 44-58. Giorgio Agamben, "Chapter 10, 'Umwelt'" and "Chapter 11, Tick", in The Open: Man and Animal , trans. Kevin Attell, Stanford University Press, 2004. Kalevi Kull, Jesper Hoffmeyer, "Thure von Uexküll, 1908–2004", Sign Systems Studies 33:2, 2005. Brett Buchanan, Onto-Ethologies: The Animal Environments of Uexküll, Heidegger, Merleau-Ponty, and Deleuze, Albany, NY: State University of New York Press, 2008. "Chapter 1. Jakob von Uexküll's Theories of Life", 2008. Jussi Parikka, "Chapter 4, Technics of Nature and Temporality: Uexküll's Ethology", in Insect Media: An Archaeology of Animals and Technology, Minneapolis: Minnesota University Press, 2010, pp 57-83. Carlo Brentari, "How to make worlds with signs. Some remarks on Jakob von Uexküll’s Umwelt theory", RIFL 7:2 (2013), pp 8-21. More papers on Uexküll by Kalevi Kull. This page was last modified on 6 July 2016, at 11:33.